Straight Talk Wireless has been very busy lately. The MVNO has made a lot of changes to its phone plans over the past few weeks. Namely, the Tracfone owned provider added more data to its wireless plans. In fact, one of the plans got a data boost twice in a matter of a couple of weeks. 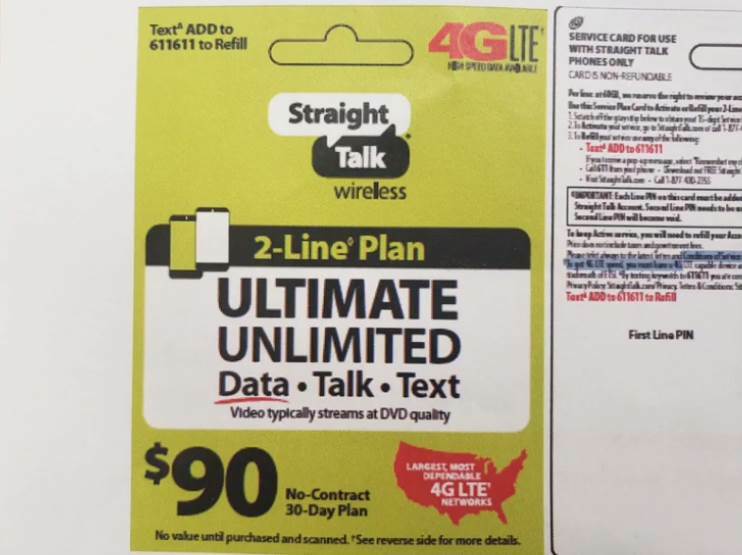 Now, Tracfone wireless dealer Mil Hustles has released details on an upcoming multi-line plan from Straight Talk that features unlimited LTE data. This plan is built upon Straight Talk Wireless's single line unlimited LTE data plan which is normally priced at $55/month or $54 with auto-refill enabled. The new multi-line option will give subscribers the ability to pick up two lines for just $90/month. That's a savings of $18-$20/month vs buying the two lines separately. Since it's based on the single line plan, it will come with the same set of limitations that plan has. Those limitations include that video streaming tops out at a maximum resolution of 480p. Also, unlimited doesn't really mean unlimited. Straight Talk Wireless has a data cap of 60GB for the plan. Customers who approach or exceed that threshold could have their accounts suspended. The plan comes with unlimited talk and text. Mobile hotspot is not supported although some customers have been able to enable it on other Straight Talk Wireless plans. Keep in mind, using hotspot is against their terms of service. Taxes and fees cost extra and are not included in the price. There is no word yet as to when the plan will be released, but it should be relatively soon given that the plan specifics are already in some dealers hands. Update: 2/21/2019, the plan is now official and available at select Walmart locations. Keep in mind that once you purchase a phone from Straight Talk Wireless, it will be locked to the network for 12 months. You'll have to keep the phone active on a Straight Talk plan for that long before you can have it unlocked for use on another network. Straight Talk Wireless phone plans and phones are sold online directly through Straight Talk Wireless and in stores exclusively at Walmart. Plan is awful. Been with Straight Talk for years. Switched to this plan and lost my internet. Changed APN settings and lost LTE ability completely. Several call to tech support have not fixed issue…. They even hung up on me when APN setting change did not restore LTE. To top it all off they refuse to refund me because i started service. How else who i know it was going to do this. Very disappointed!